Also know is the “Pin Bar”. 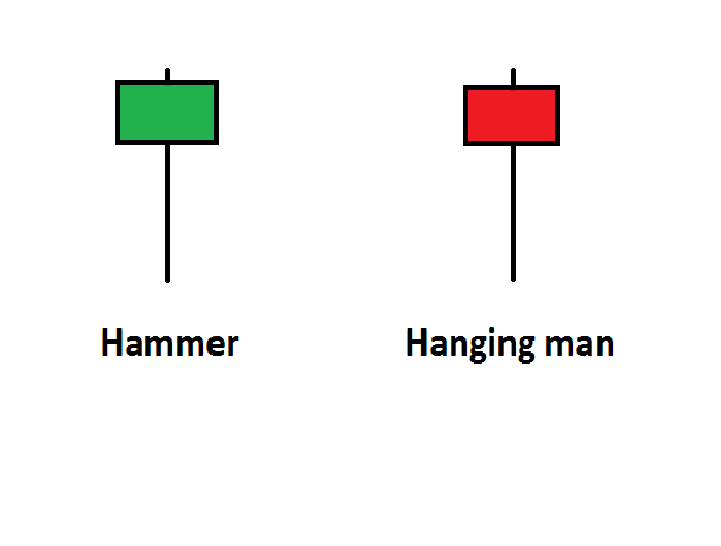 The hammer and Hanging man look exactly alike but have completely different meanings. That again depends on the earlier Price Action. Both have small, cute little bodies (green or red), long lower shadows and no or almost none upper shadow. A Hammer is a reverse signal at the end of a downwards trend. IT’s called a Hammer since the markets “Hammers” from the bottom. When the price is going down a hammer well give the signal that the jar is almost empty, the bottom is within sight and the price well likely go up again (the jar needs to be filled). The lower shadow gives us the information that the Bears have tried to lower the price even more but the Bulls were simply to strong and lift up the price a little over the opening level again. Call it survival mode. We all tend to be much stronger as soon as our live is at danger. Just to be careful, once you’ve spotted your Hammer, don’t rush in to placing your buying order. You will need more Bullish information to decide the market will go up again. Use the Hammer as a warning or signal of a potential upwards trend reversal. How to recognize a Hammer in the Japanese candlestick reversal pattern? It’s pretty simple to be honest. The long shadow is twice or three times as long as the candlesticks body. There is no or almost no upper shadow. The real body is at the upper side of the trading range. The color doesn’t really matter. However, a green body tends to be a stronger confirmation. Want to know more about candlesticks / forex or do you want to join the forex group?